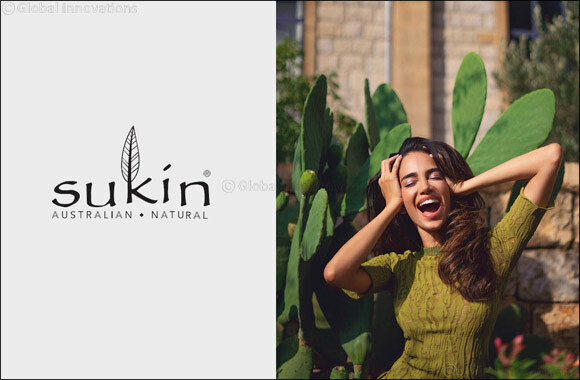 Dubai, UAE, September 12, 2018: Sukin, Australia’s Number 1 Natural Skincare Brand* has partnered with Jessica Kahawaty; model, lawyer, philanthropist and UAE’s girl next door to support the brands global expansion into the UAE. Jessica was approached by Sukin because of her genuine love of Sukin skincare, a brand she discovered independently during her time in Australia. Jessica is passionate about chemical-free and natural living, and encourages sustainability efforts to advance social responsibility globally. “Jessica is the perfect partner given her aligned values for natural and eco- friendly living and her strong presence in Australia and UAE” said Tina Randello, Global Marketing Director, Sukin. Her favourite Sukin products (Super Greens Detoxifying Facial Scrub, Energising Body Scrub, Oil Balancing Anti-Pollution Facial Mask, Certified Organic Rosehip Oil & Paw Paw Ointment) are all used in her weekly beauty regime. “I’m excited to announce that my favourite Australian skincare has launched in the Middle East. Sukin Natural Skincare provides the best natural ingredients, as well as being eco-friendly through recycled packaging, being carbon neutral and is not tested on animals. Offering affordable and effective, natural skin, hair & body care products, it’s important to me to support brands that genuinely care about our Earth and uphold ethics in skincare” Jessica Kahawaty. Australian born, but of Arabic origin, Jessica Kahawaty has bridged cultures together through her work in the fashion industry and humanitarianism. An ambassador for some of the world’s most exclusive brands, Jessica uses her name to continuously shed light on global issues around the world and empower young adults to reach their full potential through education, the arts and social media. While working in fashion at a young age, she pursued her personal studies in Law back in Sydney, Australia. Since the brands launch in 2007, Sukin have been steadfast in their commitment to creating natural skincare products, defined by a clear checklist of synthetic ingredients that will never be used in any Sukin product based on their potential harm to people, the environment or animals. Sukin is available exclusively at LIFE Pharmacy retail outlets throughout the UAE, in Holland & Barrett Saudi Arabia and soon to be launching on Boutiqaat in Kuwait.